The Cumberland & Dumfriesshire Farmers Mart had forward 2,867 head at their Annual Prize Show & Sale of Mule & Continental Hoggs with lambs at Longtown on Tuesday 17th May, 2011. 1st prize – Messrs Ridsdale, Yewtree and sold at £123 to Messrs Hall, Westend. 2nd prize – Messrs Kidd, Briggle and sold at £97. 3rd prize – Messrs Ridsdale and sold at £108. 1st prize – Messrs Smith-Jackson, Lipwood Well and sold at £90 to Messrs Dinnin, Nether Albie. 2nd prize – Messrs Jackson, Reagill Grange and sold at £82. 3rd prize – T. Davidson, Bellmount and sold at £78. Other Mule hoggs with singles to £98 and £96 Yewtree, £92 Kilncroft, £90 Porterstown and Briggle, £87 Prospect and Woodhouse. Other Continentals with singles to £98 Little Blencowe, £95 Reagill Grange. Continental hoggs with twins to £78 Little Blencowe. Mule hoggs with twins to £69 Woodhouse. Shearlings with singles to £73 for Texels from Low Brooms; Greyface £73 Prospect; Charollais £70 High House; Suffolk £65.50 High House. Shearlings with twins to £73 for Texels from Low Brooms; Charollais £70 High House. Ewes with lambs sold to a new centre for a Swaledale ewe with Mule ewe lambs at £101 each from Fieldhead; Texel £80 Little Blencowe, £74 East Steel, £73 Low Brooms; Suffolk £75.50 Sydenham; Greyface £70 Bayles; Charollais £56 Colte Coates; Roussin £55 Castlefairn; Blackface £42 Drumcork. Ewes with singles to £83.50 for Texels from Albie Rigg, £80.50 South Mains, £77 Bayles; Suffolk £75.50 Sydenham; Greyface £72.50 South Mains; Cheviot £71.50 Sydenham; Beltex £68 Sydenham; Charollais £64 Bayles; Blackface £42 Drumcork; Herdwick £38 Kilncroft. 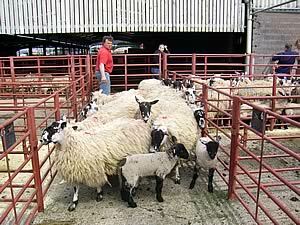 Geld hoggs to £122 for Mules from Maxton; Texel £100 Low Brooms. Store hoggs to £63.50 South Mains. Cast ewes to £85 for Texels from Low Brooms.